Note: The VCN1804 has been replaced by the SCG1805AT. For information on the new model please click here. The VCN-1804 has been developed from the ground up, giving high priority to exceptional mobility, constructional integrity and usability, with numerous optional facilities able to be added to extend the scope of the product to meet different requirements. Construction is based on our well established Structofoam specification; equipped with 200mm (8″) heavy duty, super quiet castors, rotary corner protection and soft side-wall protection. 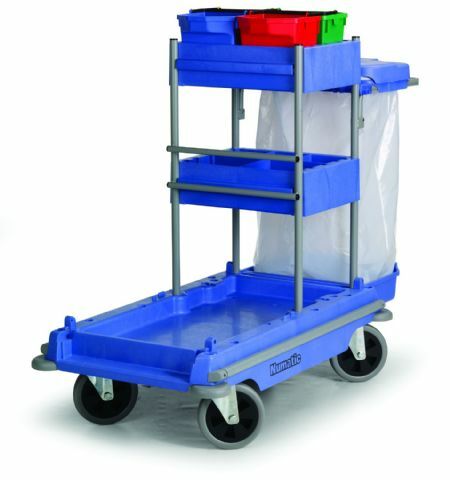 Deep base and trays provide plenty of practical storage and room for four 5L cleaning pails. The universal waste system is standard, allowing the use of a single 120-litre waste bag.